Thank God I don’t own a deep fryer at home. There’s no guessing if I’d end up having fish & chips or tempura for dinner everyday. Truthfully, I find deep fryers useful; it is afterall, a huge time saver. Marinate your meats or chop up some onions, batter it, throw it into the large vat of hot hot oil and viola, you have something crisp and edible within minutes. I am not sure about you, but I’ve never been a huge grease lover. Sure, I enjoy fried foods, but if you ask me, I’d rather grill, than fry. Maybe it’s just the health-nut in me speaking. 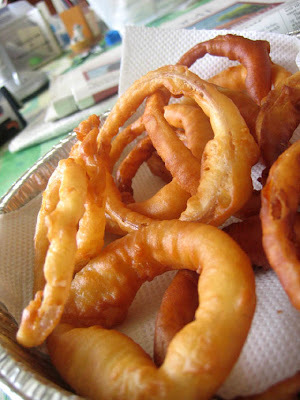 Anyway, we got bored, so I suggested onion rings. I didn’t have any onion ring recipe so I googled for one on the spot and came across a French Fried Onion Ring recipe that looked simple enough. After making the batter, we were all set to go. I’m pretty satisfied with the result, although I think it didn’t look as pretty as the picture shown on the website. Mine looked slightly deformed. But it tasted good anyway. I think I prefer the breaded kind like the ones sold at Carl’s Jr and Burger King. How often do you eat fried foods? And which fried food is your biggest weakness? Peel whole onions and then cut crosswise into 1/4 inch thick slices. Separate the slices into individual rings. Dry rings thoroughly with paper towels. Dredge rings in flour until well coated and then place on a large baking sheet. (Rings can be dredged in flour placed on a plate or the flour can be placed in a plastic bag. If using a plastic bag, several rings can be dredged at a time.) 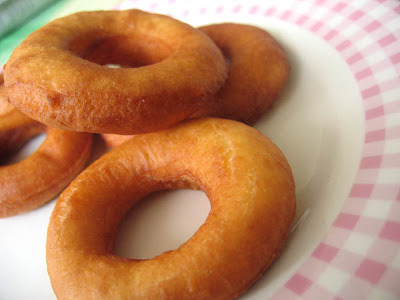 After all rings are coated, set them aside and mix batter. Combine all dry ingredients and stir until evenly mixed. Set aside. Blend eggs, milk and oil and then add the dry ingredients. Beat until all ingredients are well blended. Add 1 inch of oil to a deep pan and heat to 375° F. Dip flour coated rings into the batter and allow excess batter to drip off. 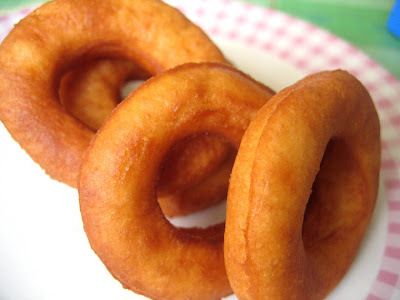 Place batter coated rings into the hot oil. Avoid overcrowding so that they can cook evenly. 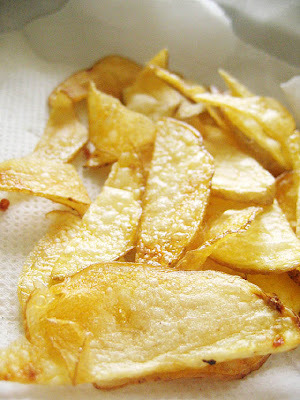 Fry until golden brown on the first side and then turn to cook second side. When both sides are golden brown, remove from the oil and place on a baking sheet lined with paper towels to allow oil to drain off. Finished onion rings can be placed in an oven preheated to 300°F to keep warm until all onion rings are done and ready to serve. It used to be doughnuts, because I worked at a grocery store and they were easily accessible. But since I have grown to loathe Krispy Kreme and no one else is as ubiquitous, nowadays my oft-consumed fried treat is…calamari! Yeah, I really can’t get enough of it, and with how often my family goes out to bars that’s a biiiig problem. Fried food heaven! Light or heavy, those donuts look delicious (and I am not even a donut fan)! Sorry, baker, no relevant comment here, I just gotta say: camemberu, food blogs are not where I’d expect to see Ebichu! I’ll be snickering like a dorky anime fan, if you’ll excuse me! Oh, did you like the donut made from Daiso flour? I saw it and wasn’t sure if could be trusted. But because of the donut craze on now, I noticed ready donut flour is often sold out. 🙁 Anyway, will try out Peony’s baked donut recipe one of these days. Hehe. anything can be deep fried, and everything after deep frying will taste great. but how come your kitchen tissues under the fried stuff look so crisp and dry?